The President of Samsung’s mobile division, DJ Koh, has revealed to CNBC that the South Korean tech giant will unveil its next-generation smartwatch at IFA next week. Although revealing little about what the Gear S4 will look like, or whether it will come in two variants like the Gear S3, Koh did suggest that current smartwatches don’t have enough sensors. This could be taken to mean that the Gear S4 will ramp things up when it comes to monitoring different aspects of our health. Apple, Samsung’s chief competitor in the smartwatch space, has long made health monitoring a central focus of its Apple Watch series. 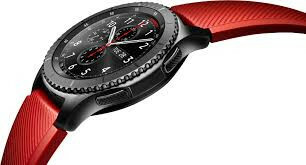 Although Samsung’s Tizen-based Gear S smartwatches have health-oriented features, they are not as fully realized as Apple has managed with its Watch and watchOS combination. Additional health monitoring capabilities could certainly help to give the Gear S4 the momentum Samsung needs to catch up to Apple’s share of the market for wearables. According to the latest data from IDC, 102.4 million wearables were sold in 2016. Although still short of some expectations, this was a 25 percent year-over-year increase on the figures for 2015. Samsung’s current market share for wearables is estimated at 5.5 percent, which amounts to around 6 million devices sold. This compares with Apple’s estimated market share of 14 percent, which amounts to around 15.5 million devices sold. "If we can put in place properly a smartwatch that can monitor everything for your health and provide the information, then the market will grow," Koh told CNBC. It was around this time last year that Samsung took the wraps off the Gear S3 models. However, on this occasion, it will come just days before Apple launches what is expected to be a completely redesigned Apple Watch 3 alongside its latest iPhones in September. Just when you thought that smartwatches were about to fall off the radar, Samsung and Apple look set to re-energise the market by going head-to-head once more.